90049-S/G Craft Made Simple Bk. 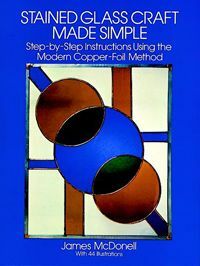 Expert manual shows how anyone, even beginners, can make beautiful stained glass pieces using the easy-to-learn copper-foil method. Drawings and diagrams explain every step — patterns and pattern cutting, scoring glass, foiling, soldering, framing, patinas, more. Includes: Step-by-step instructions & 45 black-and-white illustrations.